How to complete airport of destination field according to L/C rules? 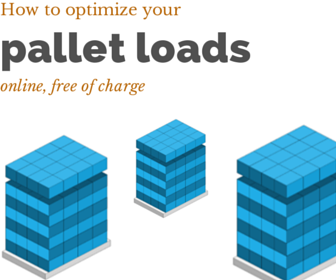 Air waybill is a transport document, which is issued in international air cargo shipments, verifies not only receipt of cargo by the carrier but also evidences contract of carriage as well. Air waybill is not a negotiable document, which is a non-negotiable document, as a result it does not represent title of the goods. Consignee can collect the goods from the carrier by identity approval without the need of surrendering at least one original copy of the air waybill at the airport of destination. Airport of destination is one of the key fields of an air waybill, along with airport of departure, as these are the first two points that banks control during document checks under letter of credit transactions. Today I would like to explain you how to complete the airport of destination field correctly according to letter of credit rules. What does airport of departure and airport of destination mean on an air waybill? How to complete airport of departure field according to L/C rules? What does letter of credit rules say about airport of departure? According to letter of credit rules an air transport document, air waybill, is to indicate the airport of destination stated in the letter of credit. As per letter of credit rules airport of destination can be shown on the air waybill by IATA codes instead of stating full airport name (for example, LHR instead of London Heathrow Airport). If letter of credit indicates the name of the country in which the airport of destination is located, it needs not be stated on the air waybill. When a credit indicates a geographical area or range of airports of destination (for example, “Any European Airport” or “Hamburg, Bremen, Bremerhaven airport”), an air transport document is to indicate the actual airport of destination, which is to be within that geographical area or range of airports. An air transport document need not indicate the geographical area. AUTO AIR FILTER AS PER PROFORMA INVOICE NO. :P-121-7 L04 DATED 03/07/2014.CPT, BARCELONA AIRPORT, INCOTERMS 2010. 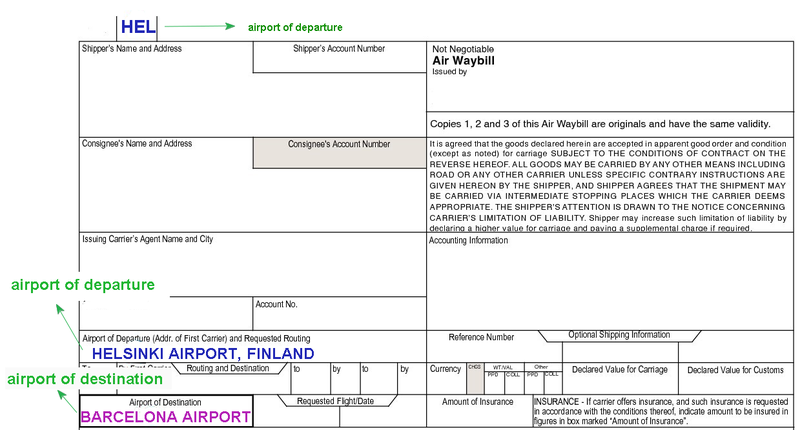 Above figure shows how an air waybill should be completed according to letter of credit rules. Airport of departure is Helsinki Airport, Finland and airport of destination is Barcelona Airport.